Lawrence, MA – September 15, 2015 – Solectria – A Yaskawa Company, a leading U.S. PV inverter manufacturer, unveiled its Decentralized Megawatt Solution today at Solar Power International. This solution combines Solectria’s three-phase transformerless inverters, an AC panel board, a transformer and monitoring, making Solectria a one stop-solution provider for customers. By continuously seeking to improve the value of its products, Solectria has expanded its versatile solution-based product line. This includes the medium voltage central solution, Solectria’s Megawatt Solar Station, and the latest three-phase transformerless string inverter solution, Solectria’s Decentralized Megawatt Solution. By combining multiple system components, this solution will simplify the customer experience by eliminating the additional work to find panel boards, transformers and monitoring that pair perfectly with Solectria inverters. 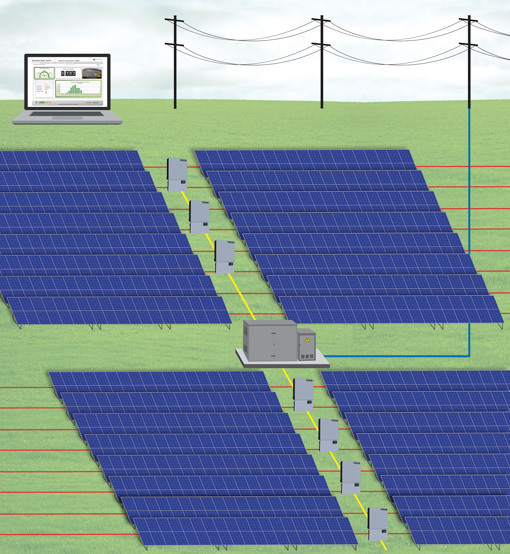 “Solectria seeks to provide easier methods for its customers to engineer and design their arrays. By offering a complete solution, it takes the guess work out of deciding which AC panel board or transformer should be used when designing megawatt or multi-megawatt arrays,” said Mark Goodreau, Director of Sales for Solectria – A Yaskawa Company. Solectria is the one of the largest commercial inverter manufacturers in the U.S. today, due to its extensive line of three-phase string and central inverters, as well as an expanding line of complementary products. Solectria supplies three-phase string inverters to the largest installers in the country. To see and learn more about this solution and all of Solectria’s offerings, please visit them in booth 2320 at Solar Power International this week in Anaheim, California. They will also host two trainings, NEC 2014, AFDI, & Rapid Shutdown and Preparing for Rule 21 on Tuesday & Wednesday, September 15th and 16th, respectively, from 4:30-5:30pm on the show floor in PV Technical Training booth #5142. To learn more or sign up for these trainings, please go to http://solectria.com/events/all-events/exhibitor-training-speaking-solar-power-international-2015-booth-2320/. In addition, a senior applications engineer will also participate on the Cutting Edge California Panel on Tuesday, September 15th discussing Rule 21 and Solectria’s preparedness.